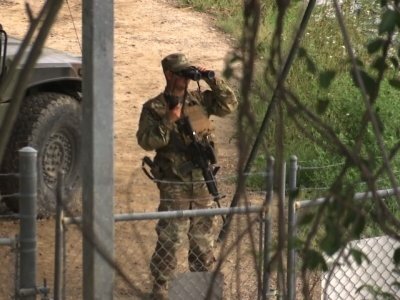 ROMA, Texas (AP) — The deployment of National Guard members to the U.S.-Mexico border at President Donald Trump’s request was underway Tuesday with a gradual ramp-up of troops under orders to help curb illegal immigration. The Trump administration also announced that Homeland Security Secretary Kirstjen Nielsen will visit this week a stretch of new border wall breaking ground in New Mexico, putting additional focus on what Trump has called a crisis of migrant crossings and crime. The only holdout border state was California, led by Democratic Gov. Jerry Brown, who has not announced whether troops from his state’s National Guard will participate and has repeatedly clashed with Trump over immigration policy. The state was still reviewing Tuesday whether it will join the effort, said Lt. Tom Keegan, a spokesman for the California National Guard. “What is different now it is happening in a different context and a different narrative,” said Fernando Garcia, director of the Border Network for Human Rights, an immigrant advocacy group. One Guard member was armed with an M4 rifle and used binoculars to peer across the river. Pickup trucks with Guard members inside circled the town square along with border patrol vehicles. Mexican children who had attended school on the U.S. side of the border showed their passports and paid a toll to cross a bridge over the river and walk home to the Mexican community of Ciudad Miguel Aleman. Monthly border arrests surpassed 50,000 in March for the first time since December 2016. The Border Patrol, which polices between but not at official crossings, made more than 37,000 of those arrests, including more than 14,000 in Texas’ Rio Grande Valley, nearly 6,000 in its Tucson, Arizona, sector and more than 4,000 in San Diego. Inspectors at official crossings made nearly 13,000 arrests in March, led by the Laredo, Texas, field office with more than 4,800 and the San Diego field office with about 3,800. Weber reported from Austin, Texas. Associated Press Writer Kathleen Ronayne in Sacramento, California, contributed to this report.